You can cover them with patterned paper or leave them as is. For this one, I used some left over raffia from a basket I got last year and added some ribbon and other embellishments. Have you got all your Christmas gifts wrapped up and ready to go? Yeah, me neither. LOL I created this quick and cute little gift bag to inspire you for those harried times. Keep a stash of these great little Square Bags #01 on hand for when you need something fast. Kraft goes with any occasion, so go ahead and order 10 or 20 in a kraft color for your stash. I stamped the gingerbread man with a brown ink onto some scrap kraft cardstock and cut him out. I accented him here and there with a white gel pen to mimic the frosting he would have on his arms, legs, and face. After cutting out the square backgrounds, adhering the buttons, and tying the ribbon on the top, this bag took less than 10 minutes to make from start to finish. Go check out what other die cuts are available at Creative Cuts and More. There is a huge variety of bags, boxes, cards and shapes to choose from for all of your crafting needs. Check out the gallery HERE for lots of great ideas to kickstart your creativity. sweet little gift for a friend. I ordered a sheet of the Ocean Breeze and Cream so I could make cards and tags to match!! I couldn't stop stamping so I added a little to the inside. It's the same arrangement that is on one side of the box. Well, I can't say your meal will be quick to prepare but with the cake slice and chair boxes from Creative Cuts and More decorating the table will be a snap! Check out these wine glass charms, they are a breeze to make using the large leaf die cut out of shrink plastic. Simply punch a 1/4" hole at the top of the charm, dab with alcohol ink. and shrink with a heat gun. I used a copper leaf pen to color the sides and back of the charms. Slide the charms on a wine class ID hoop along with some beads and you are done. These would make great Christmas gifts and you can make several sets for a few dollars. Enjoy time with your families this Thanksgiving and instead of hitting the mall on black Friday why not shop at Creative Cuts and More instead! as long as you fill it with BUTTONS!! I had the box cut from Acetate and I used Killer Red Tacky Tape to keep her together. Treasured Family Recipes 8 x 8 Mini Album Kit. You can get this Chipboard Apple from Creative Cuts & More as well! I thought since I filled it with buttons that it needed a button handle! I just strung some hemp through the button holes and tied a knot on each side. 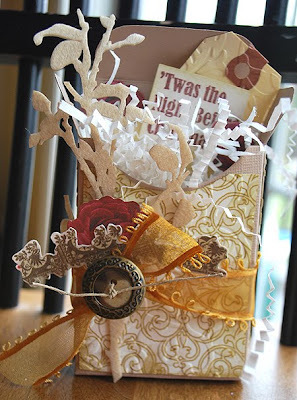 Check out last Friday's post to see a great way to give holiday CARDS as a GIFT! Have you made your Holiday Cards yet? Here's a nice way to send a set of cards to your biggest fan. I decorated a Card Portfolio cut in Smooth Strawberry Splash Bazzill Cardstock from Creative Cuts & More and filled it with these yummy Holiday cards! All stamps are from Papertrey Ink! 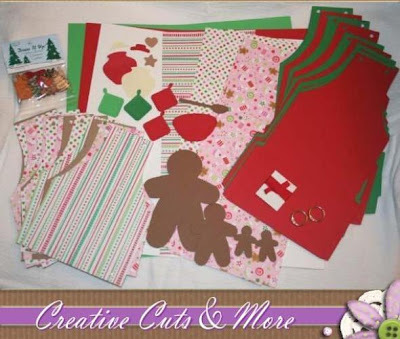 You can find so many fun holiday treats at Creative Cuts & More this time of year... from festive shapes to Hoilday Card Kits. You can pick from so many colors and textures of cardstock (or felt, or acetate, or chipboard, etc). 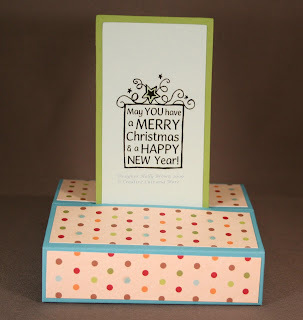 You can order your card bases in holiday colors and have shapes cut in them as well. customer service at Creative Cuts & More. All done! Great Hop - Thanks!! All the recipes were fantastic! Really appreciated all the great ideas! I posted a different recipe on my blog! Hope you all try it out! I've done step c. I became a follower. Please enter me again in the contest. Please contact Terry at Creative Cuts and More at customerservice@creativecutsandmore.com with your shipping information so she can send you your prizes!! Here are the last two cards that I created using the Christmas Card Kit available from Creative Cuts and More. You don't want to wait to order your kit - there's a limited supply of these available, and you need to get your Christmas cards created so you can mail them out to family and friends this holiday season. The card below doesn't look like much of a card, does it? It's actually a Standing Pop Up card. When you push down on the edges, the little card pops up from a slit in the middle. Too cool!!! You don't want to add bulky brads or ribbons because you need the card to slide freely up and down in the little slit. Here, I used a rub-on in the center. This last card is an A2 Purse Card with layer and gift card layer set. 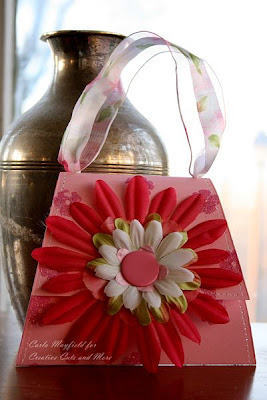 The purse is red and the inside layers are cream colored cardstock. 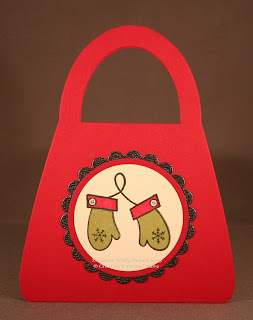 I used the mittens stamp (included in the kit) and colored the cuffs with a red copic markers (my own). I stamped the mittens again onto some green designer paper that comes with the kit, cut them out and paper pieced them onto the mittens on the cream cardstock. Then I cut them out with my own Spellbinders Nestabilities circles. I used the red and black cardstocks that are included in the kit, and cut those layers with Nestabilities as well. For the inside sentiment, I used a rub-on (included in the kit) directly on some designer paper that is part of the kit. Before I cut it out, I noticed the tree shape of the sentiment. So instead of cutting it out in a circle or a square, I used scissors to cut the sentiment out in a tree shape. Too fun! The other inside layer has some slits so you can stick a gift card inside. Perfect for the holidays, isn't it? I hope you enjoyed all these sneak peeks over the past few days. This kit is so much fun to create with, and I still have a bunch of designer papers and cardstocks left over after making all 12 of the cards. 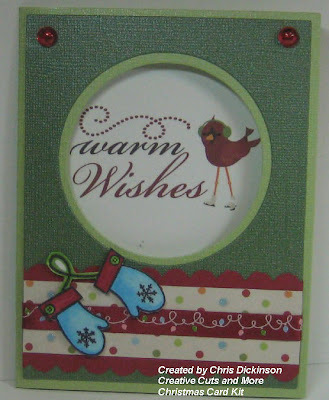 Hurry on over to Creative Cuts and More and purchase your Christmas Card Kit today. 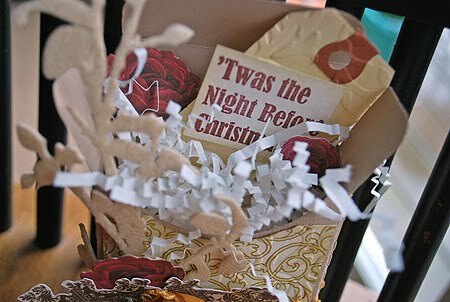 More Christmas Card Kit sneak peeks! 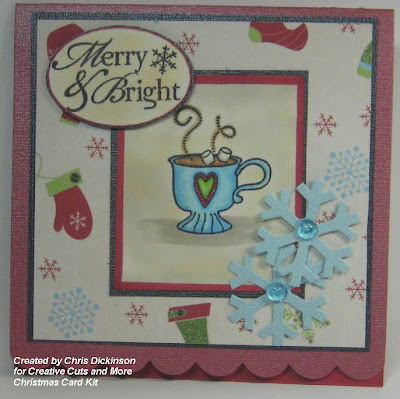 I have three more cards from the Christmas Card Kit (available from Creative Cuts and More) to show you today. My goal was to show you the wide variety of cards you can create with this kit. You could go for clean and simple or you can go for eclectic and funky or you can even go for fun and cutesy. That's how versatile this card kit is. For this card below, I kept it simple. 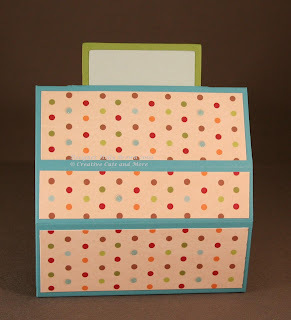 Everything you need is included in the kit except for the red ink and the white cardstock. I just stamped the sentiment on the white cardstock and cut it out in a circle shape and adhered it to the red scallop circle which is in the kit. I love the designer paper that is included in this kit. Everything coordinates so well. This is a larger card - 5" x 7". It's perfect for this larger rub-on that is in the kit. I stamped the mittens on some white cardstock, colored them with copic markers, and cut them out. I added some clear diva drops, or skittles, from the kit to each of the little scallops at the bottom of the card. 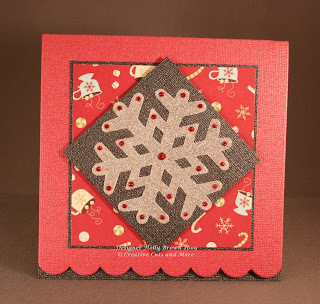 This card uses the large Tacky Tape snowflake that is included in the kit. All I had to do was take the backing off the snowflake, stick it down on the cardstock, remove the top layer of backing and then pour glitter all over it. The glitter sticks so well to this! The glitter and the red Stickles are not included in the kit, but everything else is. I love the soft shimmer of this red card. As promised, here are a few more sneak peeks for you. 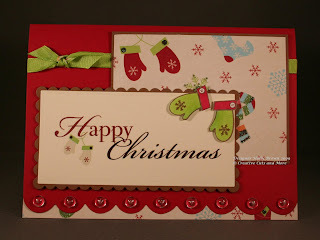 I created these from a new Christmas Card Kit that is now available from Creative Cuts and More. This kit includes die cut cards, cardstock, designer paper, ribbon, stamps, and Christmas rub-ons - everything you need to make 12 cards. All you need to supply is adhesive and inkpads. 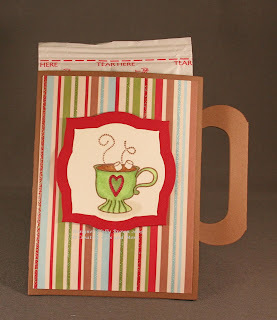 For this cocoa mug card, I stamped the cup of cocoa image (included in the kit) and colored it with copic markers. The image and the red mat was cut with Spellbinders Nestabilities. A package of hot cocoa mix fits perfectly inside this cool die cut mug. The only thing I added to this adorable Be Merry Bear card is that I embossed the darker green cardstock with a snowflake Cuttlebug folder. I love the shimmer on this card! The sentiment and the bear are from the package of rub-ons that are included in the kit. Hello! Welcome back for another FANTASTIC BLOG HOP! We have had such an exciting week and can't wait to share even MORE wonderful Christmas creations with you! As part of our celebration, CC&M will be having a great sale. For the next six days, we will offer 15% off the entire store. But act quickly, it is only active for 4 days. This sale will end on Sunday, November 15. Make sure you enter this code ccholidaybloghop1109 during checkout. 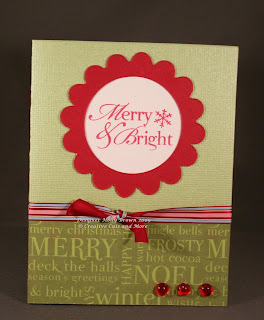 As a continuing part of the celebration CC&M will be giving away a FUN Christmas Card Kit! After you have finished the blog hop, return here and follow these directions…. (B) Leave one extra comment if you've posted a link to this blog candy on your own blog. Make sure to include a link to your specific post in your comment. (C) Leave one extra comment if you become one of our blog followers. See the right-hand navigation column to follow us. (D) Leave one extra comment if you click over to our page on Facebook and become a fan. (E) Leave one extra comment if you invite your crafty Facebook friends to become a fan of our page on Facebook. We will post the winner on Monday morning! Take a look at these fun projects created by Kat Salmon. These 5 Festive Tags are all Tag #04-Small. The stamps and rub-ons are from SU. The miscellaneous embellishments are unknown. The next are two samples of Square Box #02. The rub-ons are from SU. Our hop today starts with Steph Zerbe and she'll direct you to the next blog, and they'll direct you to the next blog, and so on. If for some reason a link is broken, don't panic. Just return here to the list and complete your journey. 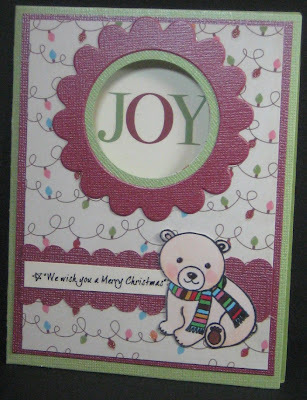 Then come on back to Die Cut Diva to enter to win a Christmas Card Kit! Thank you so much for stopping by! Have fun hopping!!! Welcome Blog Hoppers, wasn't yesterday's "Treasured Family's Recipe" blog hop a blast! If you missed it, please make sure to go through the hop to see all of the fabulous creations and wonderful recipes that were shared. 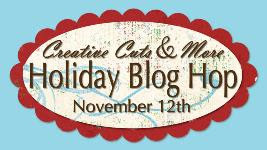 Today is the second day of the Creative Cuts & More Mega Recipe Blog Hop which features the Apron Holiday Treats Recipe Kit. We have 24 designers who will be showcasing wonderful pages and yummy Holiday Treat recipes. As part of the celebration CC&M will be having a great sale. For the next five days, we will offer 20% off the entire store. But act quickly, it is only for five more days – this sale will end on Nov 14th. Make sure you enter this code recipebloghop2009 during checkout. Now onto the blog hop...please start by going to Pam Smerker's blog. See you back here at the end of today's hop...have fun! 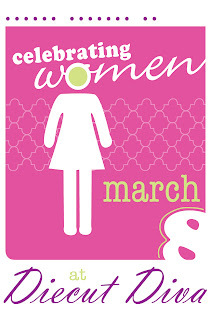 Join us as we celebrate Women! with tons of inspiration and prizes!! super talented Guest Designers as well!! leave a comment on this post to be considered. Best wishes from the Diva's at the Diecut Diva blog. 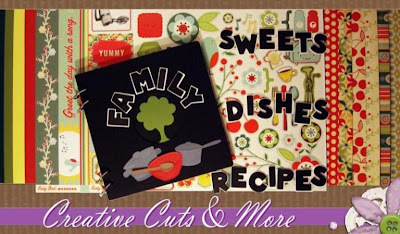 Welcome to the first day of the Creative Cuts & More Mega Recipe Blog Hop, which will feature the 8”x8” Treasured Family Recipes Kit. We have 24 designers who will be creating wonderful pages to inspire you. Plus we all will be sharing some of our own delicious treasured family recipes. At the bottom of this post, I will have some BLOG CANDY for you! Please scroll down before moving on! 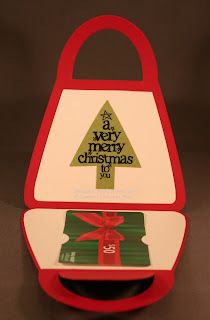 Make sure you check back at http://www.diecutdiva.com/ tomorrow for the Holiday Treats Apron Recipe Kit Blog Hop. We will also have 24 designers who will be showcasing their great creations and sharing holiday treat recipes. As part of the celebration CC&M will be having a great sale. For the next six days, we will offer 20% off the entire store. But act quickly, it is only for six days – this sale will end on Nov 14th. Make sure you enter this code recipebloghop2009 during checkout. As a continuing part of the celebration CC&M will of course give away great gifts. Each day we will give away one kit. Here is the twist – go through the blog hop, leave wonderful comments for the great designers. After you have finished the blog hop, return to (HERE) http://www.diecutdiva.com/ and instead of leaving a comment, you need to share a recipe to have a chance at winning the kit. Share the recipe on your blog and link it back and get another chance to win the kit. Help us also make this a great recipe swap. 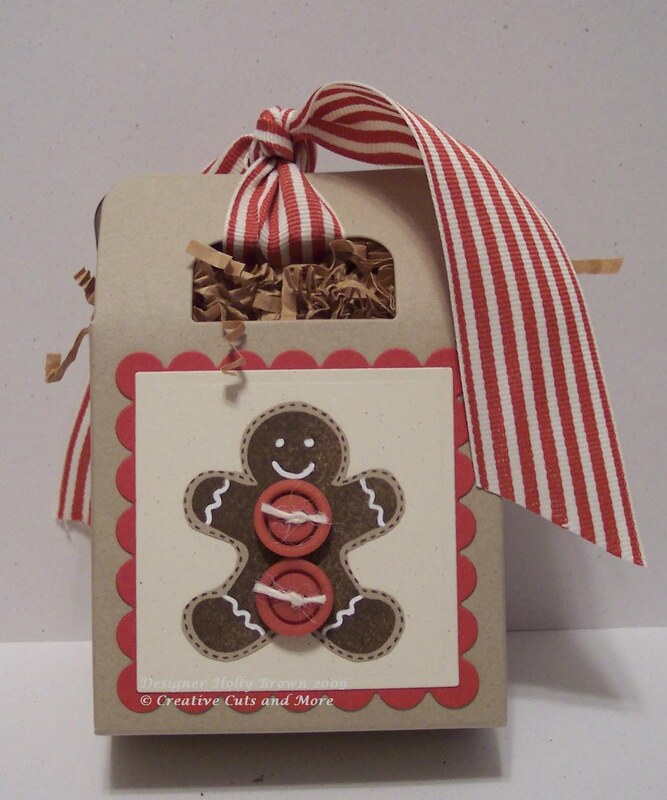 Here is a family recipe shared by Die Cut Diva. In large skillet, over medium-high heat, saute mushrooms and garlic in butter. Add scallops and lemon juice; cook and stir until scallops are opaque, about 3 to 5 minutes. Stir in sherry and heat through. Serve with rice. Serves 4. Don't forget to come back and share your family recipe for a chance to win! Thank you for stopping by! Have a great day! Mega Recipe Blog Hop is Tomorrow!!!!! Make sure you come back tomorrow! 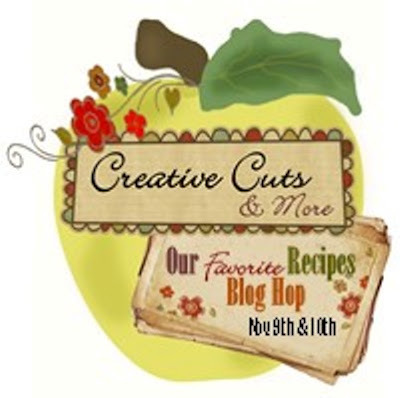 CC&M is hosting a two day Mega recipe Blog Hop! We are debuting two new recipe kits and 24 designers each day showcasing the kits and sharing great recipes. Monday is Treasures Family Recipes and Tuesday is Holiday Treats. Hop back here tomorrow and see how you can get a chance to win one of these new fabulous kits!!!! Today I have a layout to share with you! I have gotten quite hooked on these large scalloped circles. I found the hinges to be quite fun to play with too! On another project, I inked them then used crackle medium over them for a really cool look! Then there are the flowers. I don't believe I will ever have enough of these flowers! I love their shape and how well they layer! Here is a little tip: The pieces of the scalloped circle that went over the edge and I cut off, work perfect for cards! I used the Purse Note Card die cut here. The holes I put the ribbon through are part of the die cut, how easy is that, I ask you? This looks fairly labor intensive, but because I started with a die cut, it was not! Remember, you can have this purse cut out of any of dozens and dozens of papers! I started by using A Chemistry With Paper's set, Stlylized Flowers. 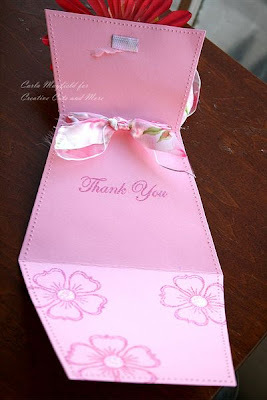 I stamped one of the solid little flowers in Pixie Pink Craft Ink randomly all over the outside of the purse. I poured on the Iridescent Ice embossing powder and heated. Then I did the piercing and faux stitching. One thing I would do differently next time is start with the piercing and faux stitching, as my Signo white gel pen was quite balky when it came in contact with the embossing powder and stray bits of glitter. It almost met its demise, as I won't tolerate recalcitrant tools in my stamp room. Either perform satisfactorily, or get out, that's my philosophy. I decided to give it one more chance, since there were extenuating glitter circumstances. Apparently, not everybody loves glitter and EP as much as I do! Then I chose and layered my flowers. I got them placed perfectly by setting the large Heidi Swap flower where I wanted it, and making a mark through the hole. I used a piece of velcro to hold the purse closed, which was not a good idea, because I ripped it when I opened it to take the picture. Creative Cuts and More sells these little magnets by Basic Gray designed specifically for this purpose, I guess I'll be buying some of those, now won't I? If you order any purse die cuts, don't forget to add a package of the slick little magnets to your cart! 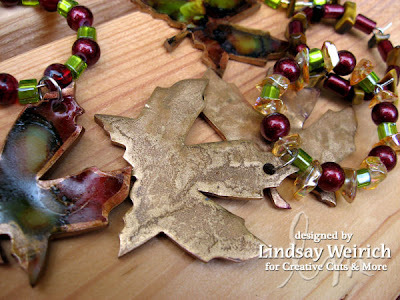 Welcome to DAY Three of the Creative Cuts and More and Caardvarks Holiday Blog Hop! Are you ready for some even MORE FUN and INSPIRATION? The two Design teams from Creative Cuts and More and Caardvarks have a whole lot of fun inspiring projects for you today! Today's fabulous prize is a $25 Gift Certificate to CREATIVE CUTS AND MORE! Wow what more could you ask for??? Another fabulous treat for you is a 15% Shopping Discount for our readers. Enter Holidayhop2009at checkout. The discount good from November 1st - 4th. 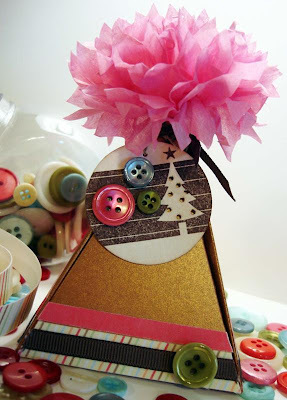 The Advent Tree is a fun set that anyone can create, even kids with a little help. Stamp little holiday images under the 24 flaps or add some fun stickers and count your way to Christmas! Now for more eye candy for you - you will want to HOP along to each of these blogs and end at the Caardvarks blog to tell us what you loved best about the hop for a chance to win! Have fun on the hop! Thanks for stopping by! 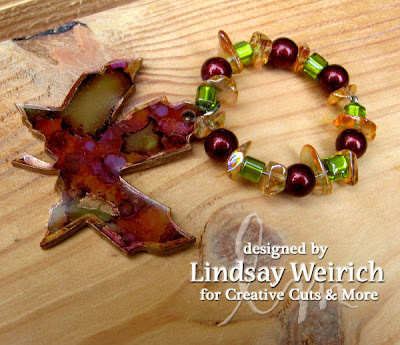 Welcome to DAY TWO of the Creative Cuts and More and Caardvarks Holiday Blog Hop! Are you ready for some MORE FUN and INSPIRATION? 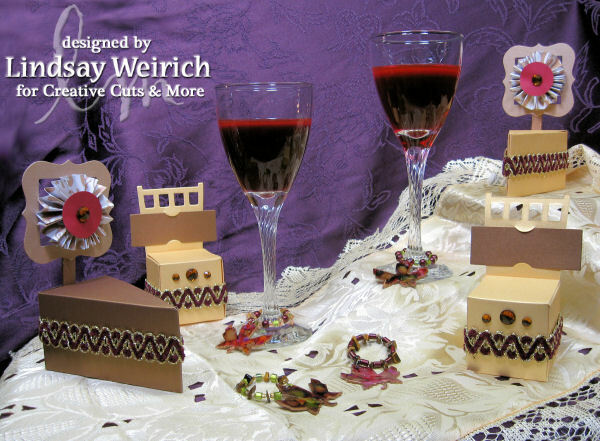 The two Design teams from Creative Cuts and More and Caardvarks has MANY MORE SWEET TREATS for you today! This project was created by Creative Cuts and More's talented designer Stephany. 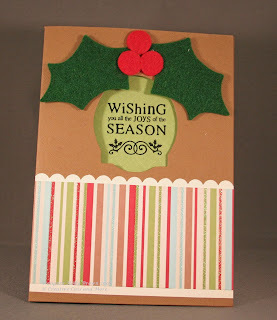 Welcome to the Creative Cuts and More and Caardvarks Holiday Blog Hop! Are you ready for some FUN and INSPIRATION? You are in for a real treat today and the best part about it seeing as how we are coming off the Halloween holiday is there are NO calories or cavities! This blog hop will go the next three days! Today we will start with HOLIDAY CARDS... you will need to come back to see what we will offer for eye candy tomorrow! Each day there will be a different FABULOUS prize too! This card is a SNEAK PEEK to our upcoming release (NEXT WEEK!) 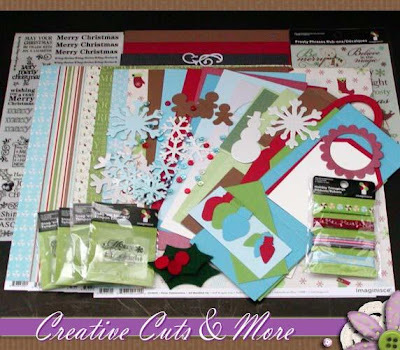 of Creative Cuts and More's Christmas Card Kit! You will definitely want to come back next Monday for our Recipe Book Blog Hop - LOTS MORE chances to win - grab the blinkie below and help get the word out on your blog! Thanks so much for coming by! HAPPY HOPPING!